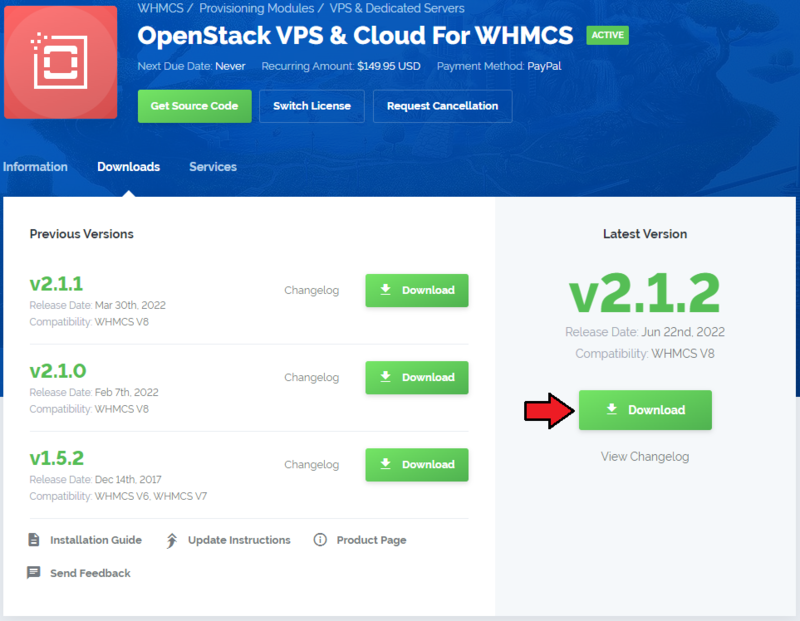 OpenStack VPS For WHMCS is a module which allows you to automatically provision virtual servers to your customers. The great advantage of this module is the fact that customers can order and manage virtual servers, backups and many more in your own WHMCS client area. Additionally, it allows you to conveniently overview and manage all the customers' servers. 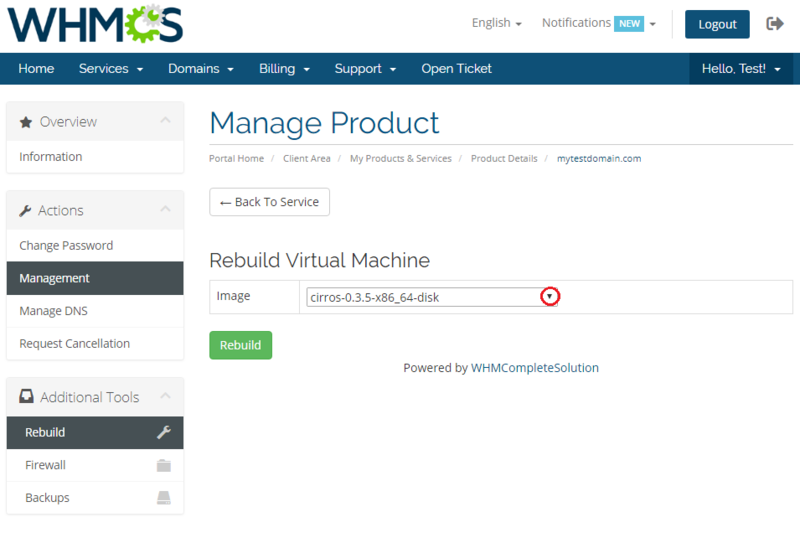 This tutorial will show you how to successfully install and configure OpenStack VPS For WHMCS. 4. When you install OpenStack VPS For WHMCS for the first time you have to rename 'license_RENAME.php' file. File is located in 'modules/servers/OpenStackVPS/license_RENAME.php' . Rename it from 'license_RENAME.php' to 'license.php' . 6. The last step is setting up a cron job (each 5 minutes suggested). Go to the 'Setup' → 'Products/Services' → 'Servers' and press 'Add New Server' . 8. Next, enter your server name and connection details. Provide your IP address/hostname with or without the endpoint name (you can find it in the OpenStack 'Authentication URL' field). Do not forget to select which API version you want to use ( 'Default', 'V2' or 'V3' ). Note: To find your 'Tenant ID' , log in to your OpenStack panel and go to the 'Identity' → 'Projects' menu. Now you will need to identify the row which corresponds to your project. The 'Tenant ID' will be located in the 'Project ID' column of the identified project. Optionally, enter your OpenStack custom Domain or leave this field as 'Default' . If your OpenStack uses https or any custom port, you can additionally provide the relevant configuration in Secure and Port fields. Finally, press 'Save Changes' . 9. After you have configured your server correctly, you can check the connection with the OpenStack server. Simply edit the previously created server and press 'Test Connection' as shown on the screen below. During the test, connection with all related endpoints will be checked. Additionally you can change the endpoint addresses to make sure that all services have been connected successfully or select 'Don't use' if no endpoint is applicable to your OpenStack. Note: Any chosen endpoint address will be automatically saved after its selection so there is no need to save it manually after each change introduced. For more information about connections, visit the Common Problems and Tips sections. 11. Enter a name, click on your previously created server, press 'Add' and afterward 'Save Changes'. 12. In order to create and configure a product, go to 'Setup' → 'Products/Services' → 'Products/Services' . 15. 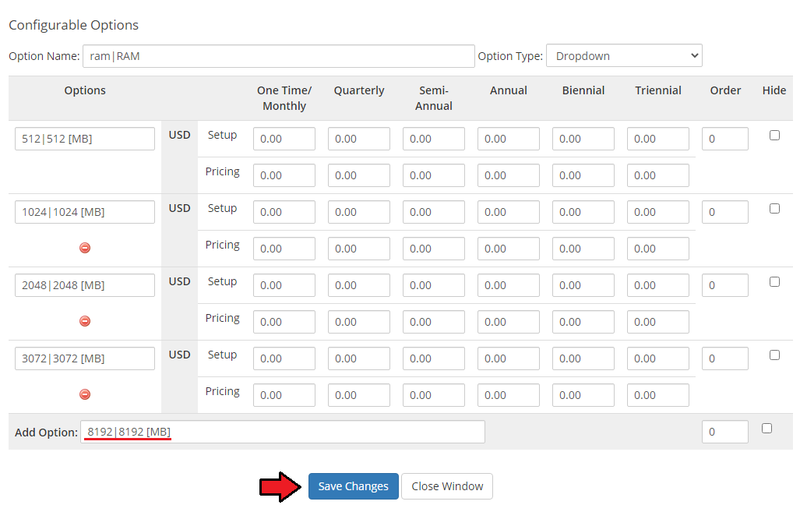 Afterward, choose your product group and type from the dropdown menus, enter your product name and press 'Continue'. 16. Now, go to the 'Module Settings' section, choose both 'OpenStackVPS' and your previously created server group from the dropdown menus. Module should automatically save and reload settings. If not, click on 'Save Changes' manually. 17. Start from selecting a 'Default Tenant' . 'Check access' will return 'OK' if you set up permissions correctly. 18. Afterward, set up network. Choose 'Fixed Network' , 'Floating Network' and 'Default Number Of IP Addresses' . We will set up the network without a floating IP address as presented on the following screen. Additionally, choose a quantity of IP addresses assigned to a product by typing it into 'Default Number Of IP Addresses' . 19. At this step you can configure the backups settings. Mark the 'Backups Routing' checkbox if you want to allow replacing the oldest backup with a new one when the backup files limit has been reached. 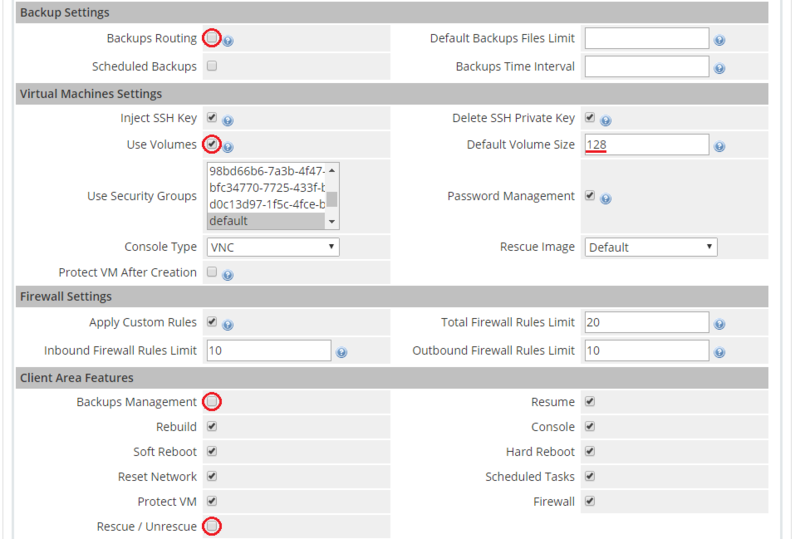 Afterward, enter a number of allowed backups that can be created into the 'Default Backups Files Limit' field. Enter '-1' for unlimited. You may also let your clients define the backups tasks, they will be then created automatically according to defined time interval. 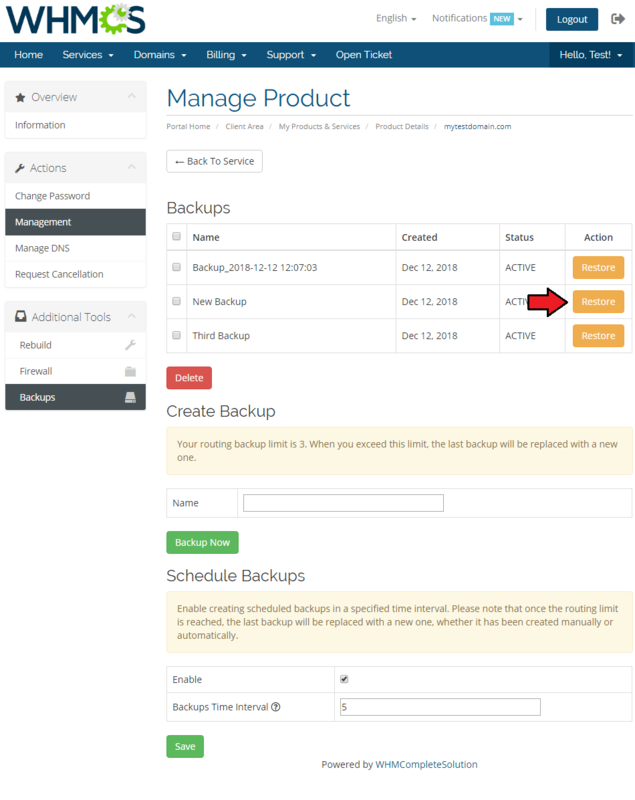 Select 'Scheduled Backups' option and then set the minimum time interval which your clients will have to obey when defining their task schedule at 'Backups Time Interval'. Note: The number of backups created manually and those scheduled and created automatically is counted together and their overall sum cannot be higher than the defined limit. 20. Define the virtual machine settings. Mark a security group from 'Use Security Groups' and select 'Console Type'. Apart from the selected here groups you may also apply custom rules to the VM. You can learn more about them at Custom Security Group section. If you wish to use SSH keys, leave 'Inject SSH Key' marked (virtualization has to support the 'Inject File' feature). In order to use passwords for your VM, leave 'Password Management' marked (virtualization has to support the 'Set Admin Pass' feature). Please make sure, that virtualization used by you supports mentioned actions. Full list of supported features can be found here. Important: It is recommended to leave 'Delete SSH Private Key' marked. The following types of console can be chosen: 'VNC', 'RDP', 'SPICE' and 'Serial'. To do so, make sure to tick the Use Volumes checkbox and enter the desired number into the Default Volume Size field. Note that once this option is enabled, your clients will no longer have access to the Backup and Rescue functions, so you may as well leave the respective fields empty. 22. Next, select features available at the client area. Mark the checkbox next to a feature in order to enable it. 23. In addition, you can also choose whether you want to send a welcome email after the VM has been successfully created by cron. This feature can prove useful if you want clients to receive the notification once their VM is ready rather than immediately after product activation. If you decide on this option, we suggest that you also set the standard WHMCS configuration of the 'Welcome Email' to 'None' in the 'Details' tab of a product. Otherwise, the customer will receive both emails - after the product has been activated and after the VM has been successfully created on OpenStack. Press 'Save Changes' when you are done. Our module allows you to offer OpenStack VPS to your clients in two ways, with either predefined or configurable resources. 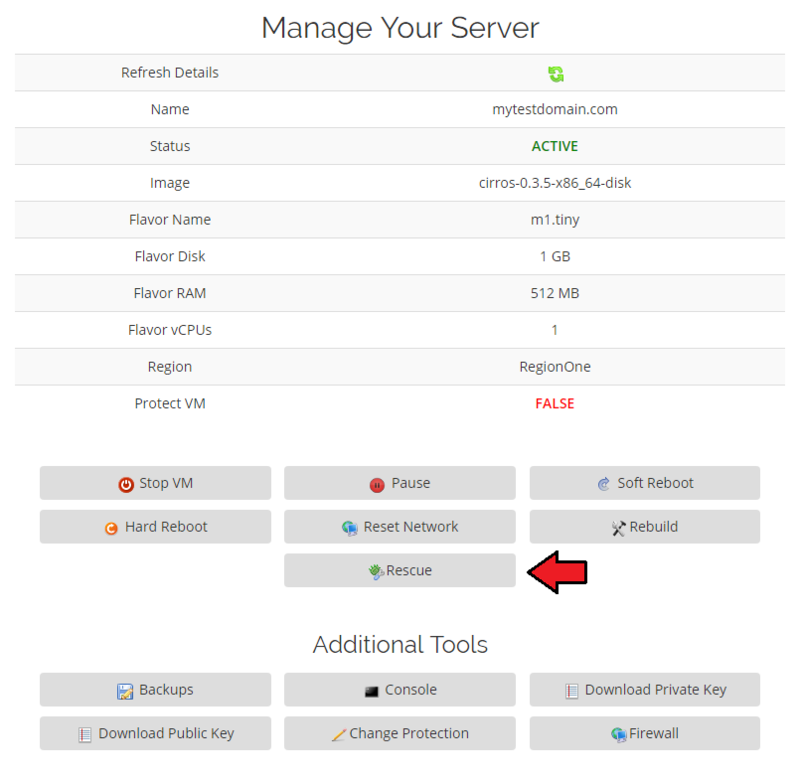 In this section we will show you configuration of VPS with predefined resources. Detailed information about configuration of VPS with resources chosen by a client can be found here. 24. Select a 'Default Flavor' and 'Default VM Image' . 'Default Flavour' defined resources assigned to a VM while 'Default VM Image' allows you to choose the VM image used to create a new VM. 25. 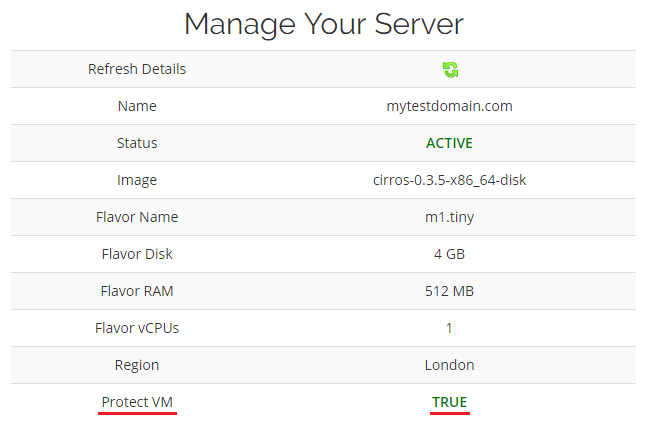 Preparing VPS with configurable options consists of pressing 'Generate default' as shown on the following screen. It will prepare default configurable options which can be afterward easily edited as described in this article. Important: Configurable option 'flavor|Flavor' will be overwritten by 'disc|Disc', 'ram|RAM' and 'vcpus|VCPUs'. Remove 'disc|Disc' , 'ram|RAM' and 'vcpus|VCPUs' configurable option and rely completely on 'flavor|Flavor' . Remove 'disc|Disc' and 'vcpus|VCPUs' , and allow 'flavor|Flavor' being overwritten by 'ram|RAM' (multiple combinations allowed here). Remove 'flavor|Flavor' and rely completely on 'disc|Disc' , 'ram|RAM' and 'vcpus|VCPUs' . Note: The second and the third options results in creation of a new flavor on your server each time a new order is made. 26. Optionally, you may create a custom security group with customised rules that will be added while creating the virtual machine. Select 'Apply Custom Rules' option at Virtual Machine Settings and enable 'Firewall' option in the client area. Edit the additionalRules.json file content located at modules/servers/OpenStackVPS/config/additionalRules.json directory. direction - "egress" or "ingress"
ethertype - "IPv4" or "IPv6"
remote_ip_prefix - IP address, format bound to the ethertype field, e.g. : "::/0"
port_range_min - value between 1 and 63535, eg: "101"
port_range_max - value between 1 and 63535, e.g. : "200"
In case you enter the same value in the 'port_range_min' and 'port_range_max', then one port will be set, not a range of ports. protocol - enter one of the following: "tcp", "udp", "icmp", "custom"
Important: 'Protocol' must be provided if 'port_range' has been defined. Now, that your file is ready, a new security group will be created in your OpenStack panel and visible in the product's Module Settings under 'Use Security Groups' on the product creation. The rules are visible for the client in the 'Firewall' section. If you terminate the product, this group will be deleted as well. 27. In this area, you can write a custom script using Cloud-Init and arrange it to be executed on newly created VMs. This way you can automate your work instead of making all kinds of specific images for specific tasks manually. Scripts can be written in standards like Bash or YAML. Initial scripts have to be supported by VPS operating system to be executed properly. Scripts should be used only by advanced users. The incorrect usage of the scripts may damage your system! On the example below, we will show an exemplary script responsible for setting the password to 'newpass01' for the Ubuntu root user. You can configure scripts in the same format, but for clients' individual choice when ordering the product. 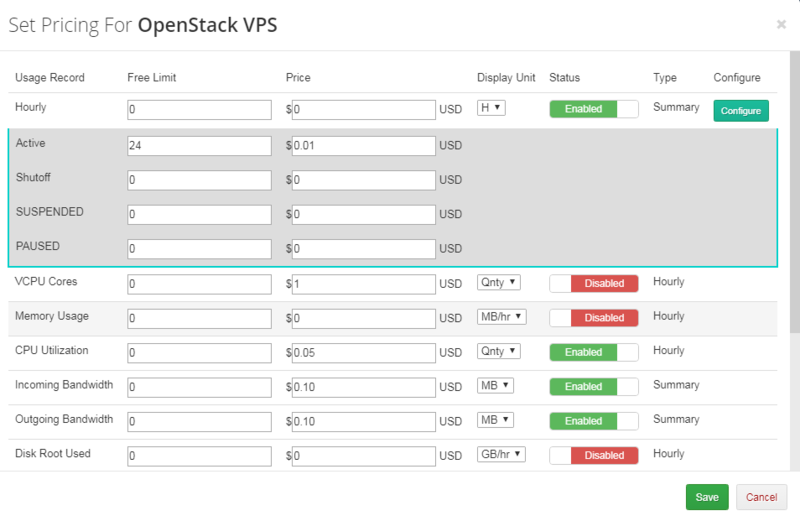 All you need to do is add a new configurable option and assign it to the OpenStack VPS product. Note: These scripts are executed regardless of the script specified in the module settings. 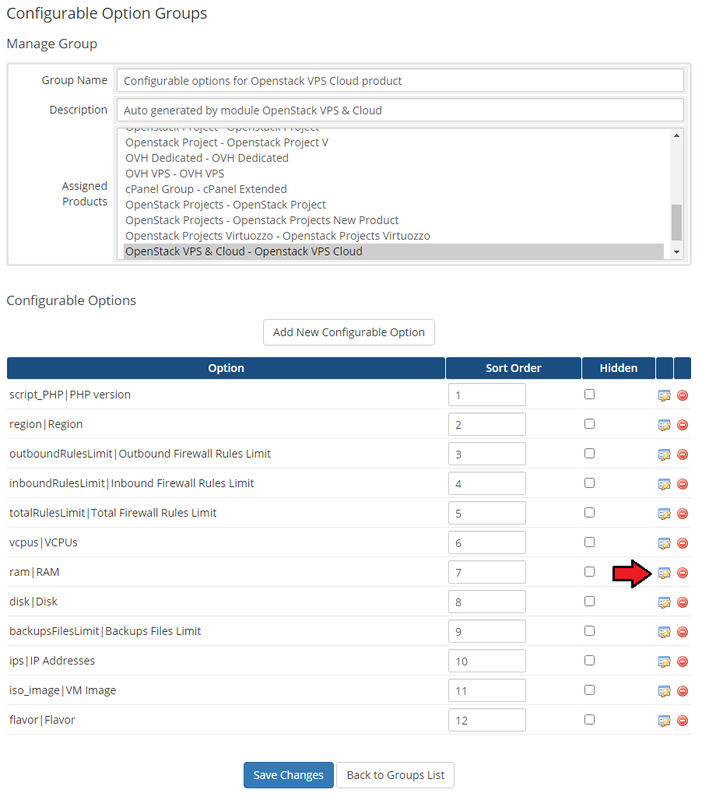 The easiest way is through the edition of existing 'Configurable options for the OpenStack VPS' group, and adding the new configurable option there. Using this method, you can perform assorted actions on newly created machines, e.g. : modifying files, preinstalling & preconfiguring software, executing any statements that would normally be executed via the terminal. The general rule is that configurable option names should begin with script_prefix to be recognized as containing a custom script. 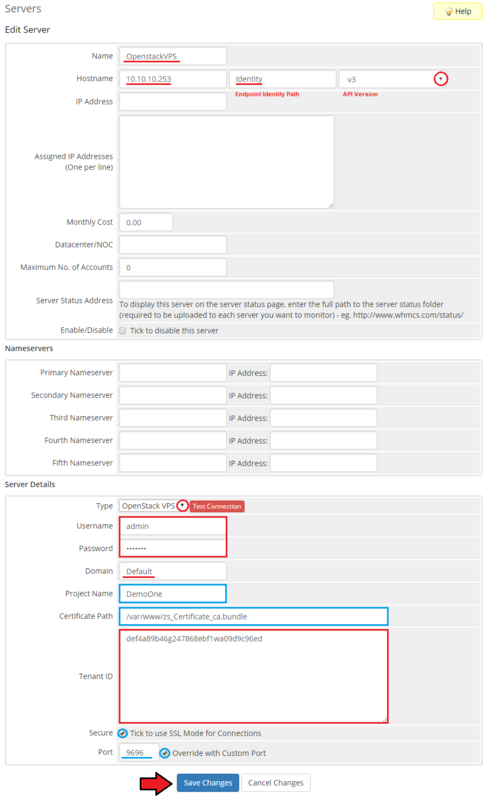 Then, choices under the option have their own names which are matched with a name of existing file with the corresponding script under the yourWHMCS/modules/servers/OpenStackVPS/scripts path. Note that files with scripts have to have exactly extension corresponding to the given entries in the configurable options. You can add many scripts in the exact way. OpenStack VPS For WHMCS allows your customers to manage their OpenStack VPS via the client area in your WHMCS system. 1. 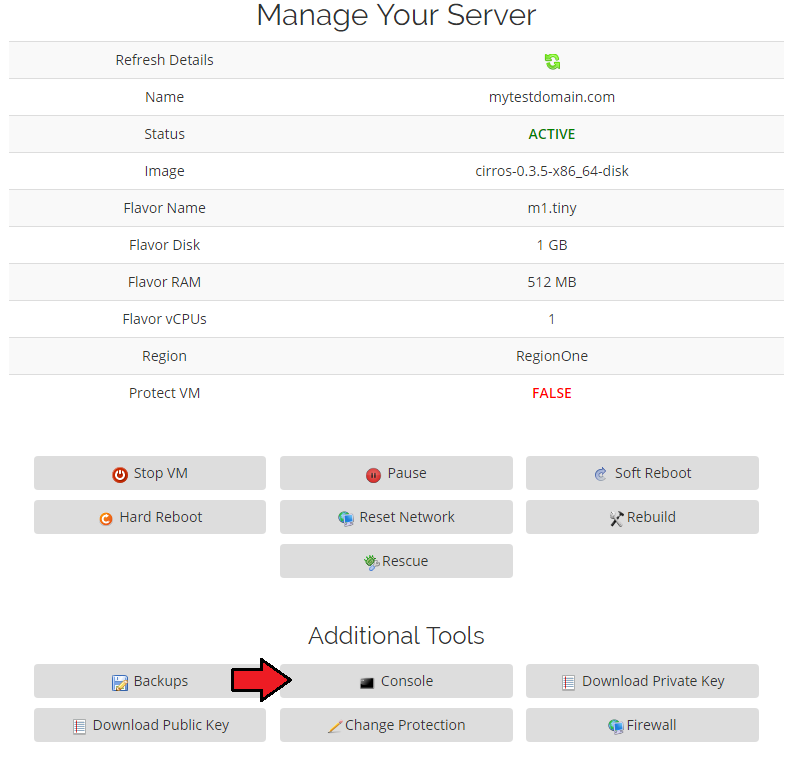 Configurable options which enable you to view current VPS resources and change VPS specifications through changing configurable options and pressing 'Change Package' . 2. Module commands enable you to manage VPS status. 3. 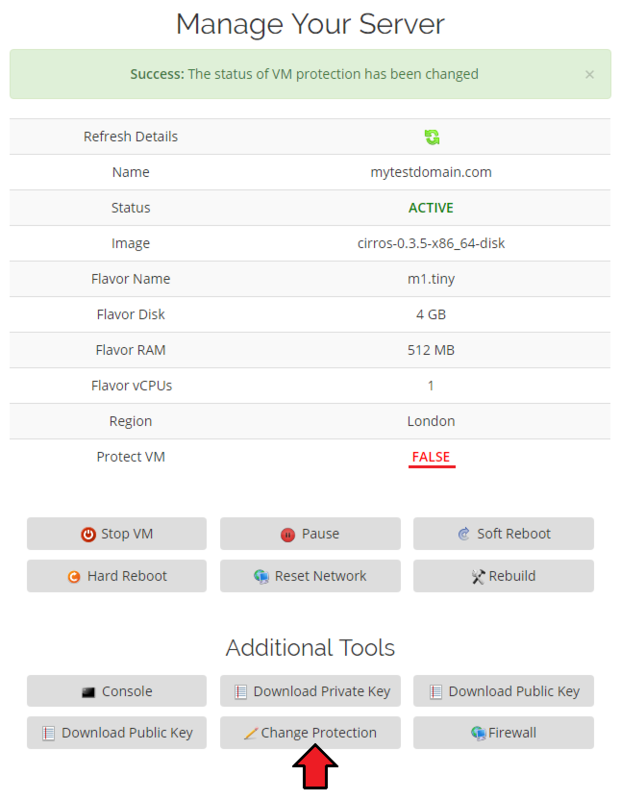 Here you can find VPS details and refresh them through pressing the 'Refresh Details' icon. 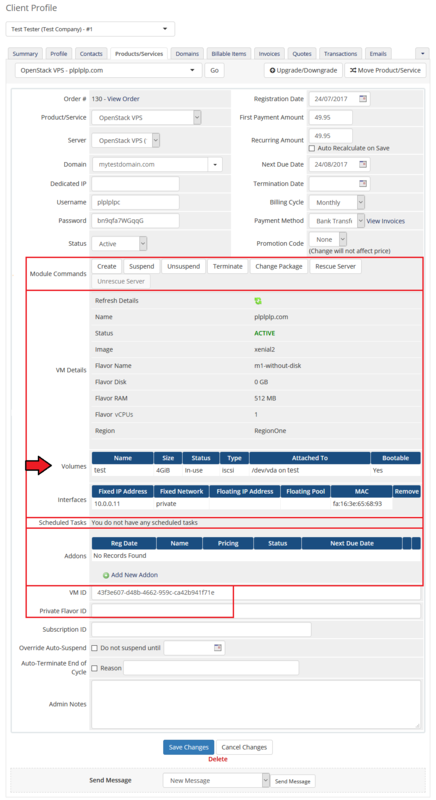 If you decided to select the Use Volumes feature, you will see an additional section named Volumes. Owing to configurable options, you are able to offer a product which your clients can tailor according to their needs. Important: VPS is not created immediately after ordering 'Create' . Therefore, it is wise to inform your clients about the delay. Client area interface of OpenStack VPS should look like the one on the screen below. As you can see, the control panel contains useful options needed for managing a VPS. Module allows your customers to easily start/stop, pause/unpause, resume, soft reboot, hard reboot and reset network of their servers through pressing the specific button. Clients can also rebuild the server, access noVNC console, create a backup and view scheduled tasks. At 'Tasks' your customers can view all requested tasks that was not yet completed. Each task has additional information bounded to them, like a type of task, attempts to perform tasks or a last returned response. The rebuild feature allows your clients to change a server image. To reinstall your server, choose an image and confirm through pressing the 'Rebuild' button. The rescue mode provides a mechanism for a VM access even in case the VM's image renders the instance inaccessible - e.g. if instance's filesystem becomes corrupted. The rescue VM will be launched to permit the user to fix their VM. 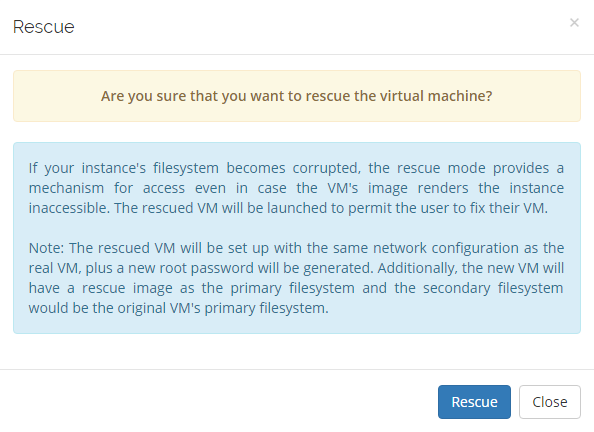 Before you continue please note that the rescue VM will be set up with the same network configuration as the real VM. 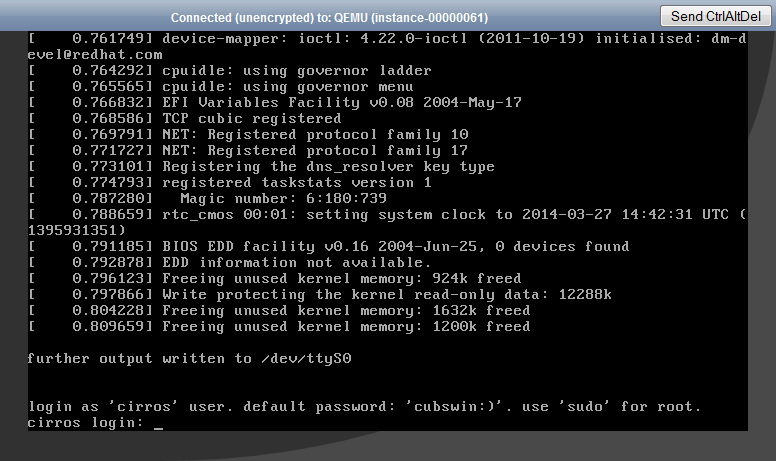 Moreover, a new root password will be generated and the VM status will change to 'RESCUE'. The new VM will also have a rescue image as the primary filesystem and the secondary filesystem would be the original VM's primary filesystem. When you want to disable the rescue mode, click the 'Unrescue' button. The VM status will then also return to 'ACTIVE'. Your customers can also create backups of their VPS. To do so, press the 'Backups' button. In this section you will find three different categories related to backups and their management. 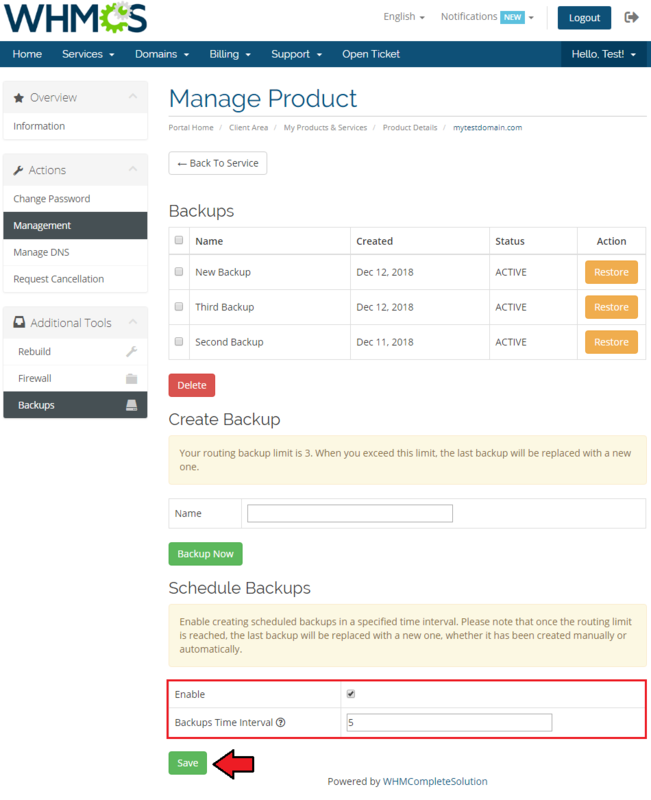 At the very top you will find a current list of existing and available backups with details on their status, creation date and action button. Underneath, you may create backups manually at any moment you need. Simply type in a custom name of your backup and press the 'Backup Now' button. Note: If there has been a limit set on the number of allowed backups and you have just reached that restriction, then backup with the earlies creation date will be removed to make room for the new on. 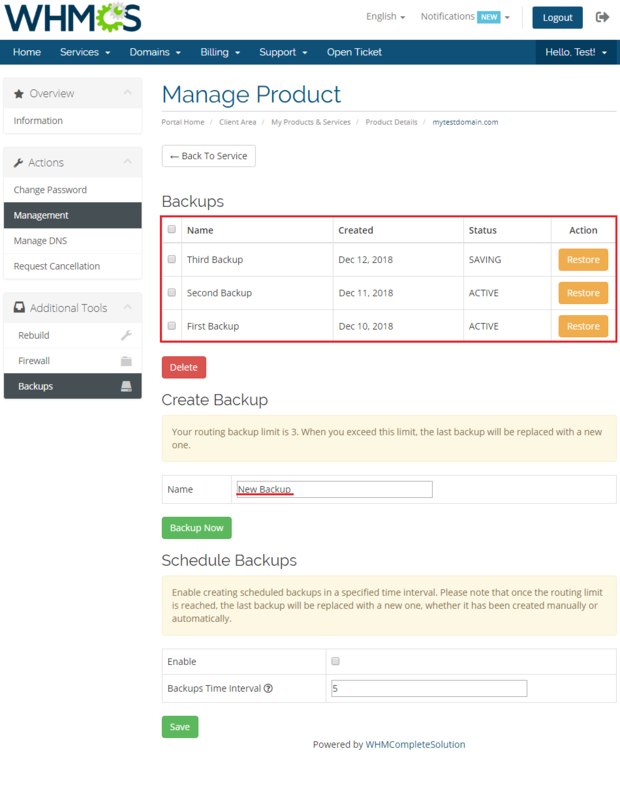 Clients are also given the opportunity to crate backups automatically by enabling the option: 'Schedule Backups'. 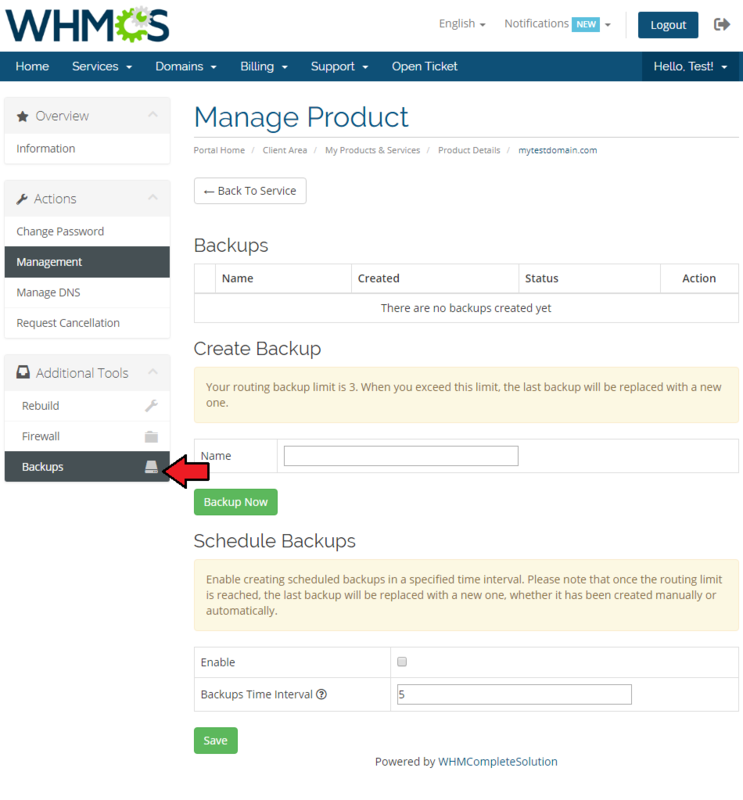 When enabled, provide a time interval to wait until the next backup will be created to define the tasks routine. The entered time interval must be higher or equal to the limit defined by your administrator. 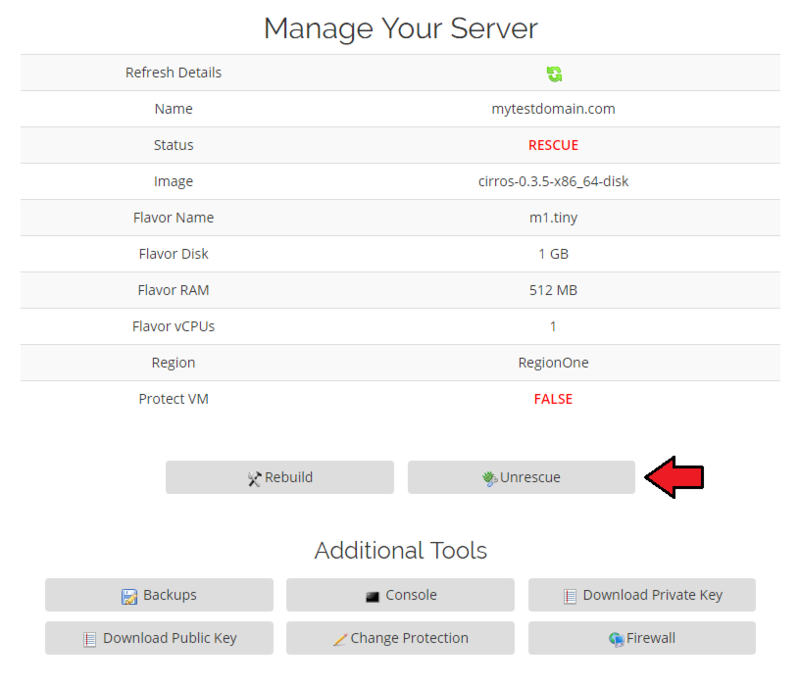 To restore a VPS from backup, simply press the 'Restore' button next to it. As you may notice on the following screen, presented earlier 'First Backup' has been replaced with the created manually 'New Backup' and then 'Second Backup' with the one created automatically. It was caused by a backup routing feature which was triggered by reaching the backups file limit. Note that it is also easy to distinguish which backups were created manually - those with a custom name, and which automatically - default name including its exact date and hour. One of the most interesting functionality is a noVNC console where your clients can remotely manage their server. To access it, simply click on the 'Console' button. noVNC is a browser based VNC client. It was implemented using HTML5 Canvas and WebSockets. In the product configuration page you can enable the 'Protect VM After Creation' option which prevents the termination or rebuilt of VM. The selected status of this protection will be applied to both admin area and client area. Moreover, if the 'Protect VM' option is enabled in the client area, the client will be empowered to toggle the current protection status. 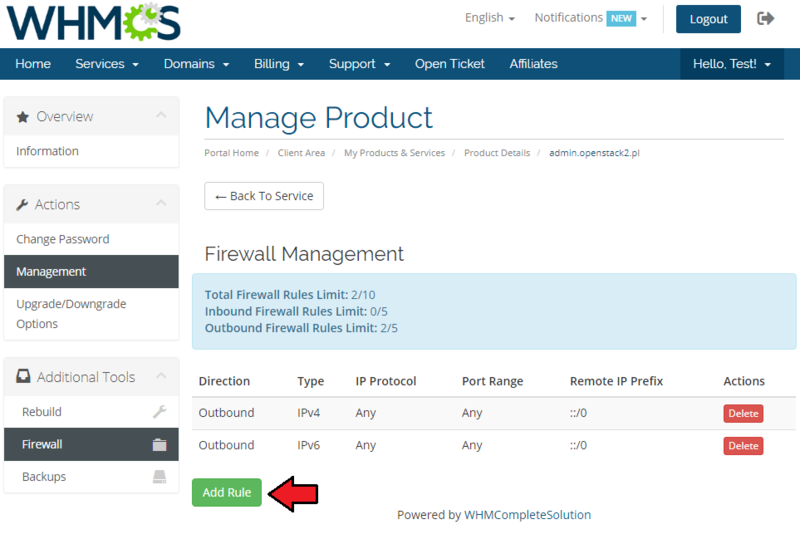 The firewall management page allows your customers to view, add or delete existing rules on a security group assigned to the product. To add a new firewall rule, use the button marked on the following screen. 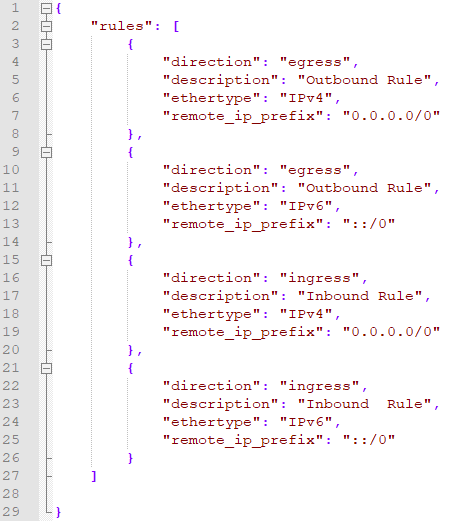 Next, choose the rule type (TCP or UDP), direction (inbound or outbound) and ether type (IPv4 or IPv6). Depending on the port you choose, you will be able to add a rule for a single port only, a range of ports or all ports at once. 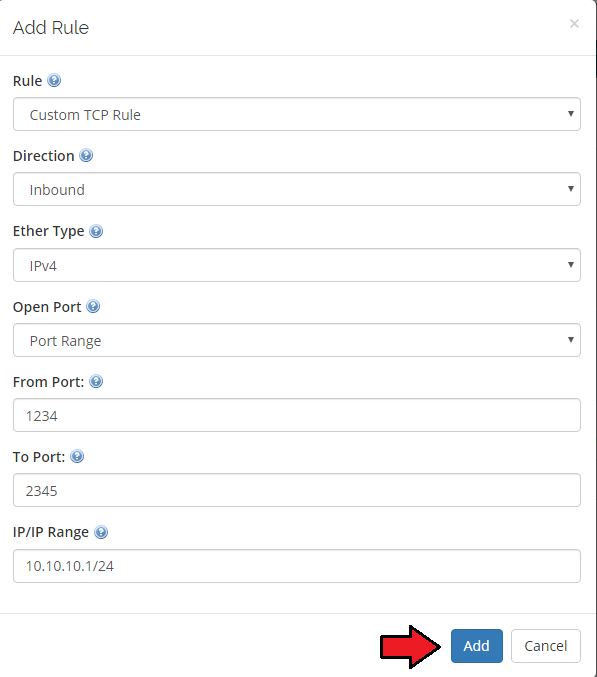 You can also select one of the predefined ports or use a custom one. Finally, provide a single IP address or specify the range of addresses using the CIDR format (e.g. 10.10.10.1/24) and add rule description if you wish. OpenStack VPS For WHMCS allows you to set up two types of network. The first one is a network without a floating IP address. To set up this type of network, choose 'Public' as 'Fixed Network' and 'Disabled' as 'Floating Network' . On the following screen you can view an exemplary topology of such network. The second type of network is the network with a floating IP address. Select 'Shared Network' as 'Fixed Network' and 'Public' as 'Floating Network' . In case that standard configuration is not fitting your needs, you can adjust it through configurable options. To do so, go to 'Setup' → 'Products/Services' → 'Configurable Option' and press the edit button next to a configurable option used by your product. Its name is 'Configurable options for your_product_name' . To do so, edit 'ram|RAM' by pressing the edit button as shown on the screen below. You will see a popup window, so make sure that your browser will not block it. To add a new option, enter it in a textbox under all other options. If you want to replace it with an option you currently have, simply edit its text box. Next, press 'Save Changes' . 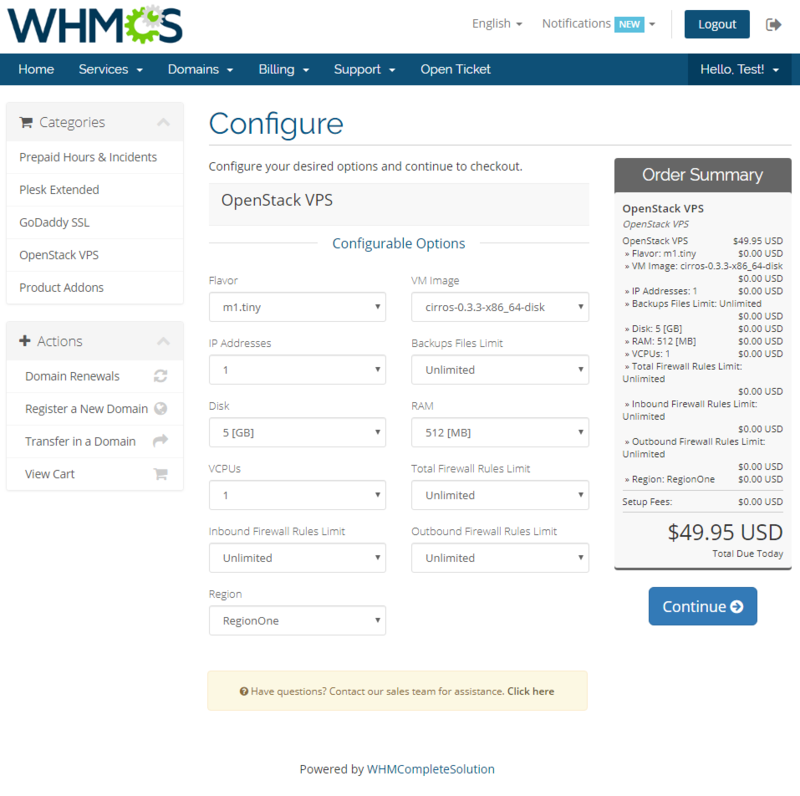 When you combine OpenStack VPS For WHMCS with Advanced Billing For WHMCS, you will be able to set up additional billing options. Module allows you to charge your customers based on the server resources used by them. Note: Advanced Billing currently supports only API prior V3 (OpenStack Ocata). A new compatibility will be added soon. With Advanced Billing module, you can also display your customers the current server resource usage, their cost, usage history and charts. 1. Due to some requests may take time to be completed, we implemented 'Scheduled Tasks' . Tasks visible at 'Scheduled Tasks' are subsequently performed by a cron job. Full list of tasks supported by 'Scheduled Tasks' are: create, terminate, change package, remove IP address and remove backup. 2. Important: module has to use admin endpoints instead of public endpoints. In properly configured OpenStack server, wget from WHMCS server should be able to get any data from any admin endpoint. 3. A primary IP address is always assigned by OpenStack server when a VM is created. Therefore, if you decide to order 2 IP addresses, then 3 addresses will be assigned. or leave it empty in the product's 'Module Settings'. This page was last modified on 8 March 2019, at 09:25. This page has been accessed 113,247 times.